Our first morning in Sri Lanka (after a long breakfast) found us heading into Pettah Market, a wholesale market in the middle of Colombo. We went there because we decided to try to follow the one day Colombo tour detailed in the lonely planet. The market itself is a tough introduction to Sri Lanka. 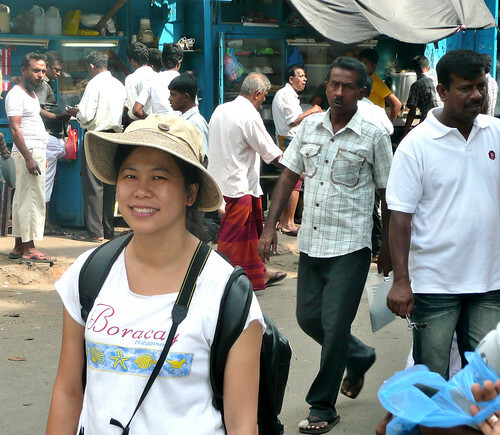 We were the only foreigners in the market (that we saw), it was hot, noisy and crowded. I was feeling sick and both Queenie and me were jet lagged. It was a tough place to be first up. At any rate, we soldiered through the market first visiting the Hindu Temple, the Mosque, the Catholic Church and the Dutch museum. Although it was tough we did have a rich experience in the market. We arrived in the Market early on a Friday morning after a breakfast. We were both really jet lagged and I wasn't feeling well. The market was quite a shock for both of us but we did find it interesting. It was hot and dusty and saw some interesting and shocking things. The video below shows some of the places we went to in the Market including the Hindu Temple, the Mosque, walking through the streets, the Catholic Church and the place we had a snack. Although it was a bit of a shock to the system, we both felt it was a good introduction to Colombo: kind of like being thrown in the deep end. 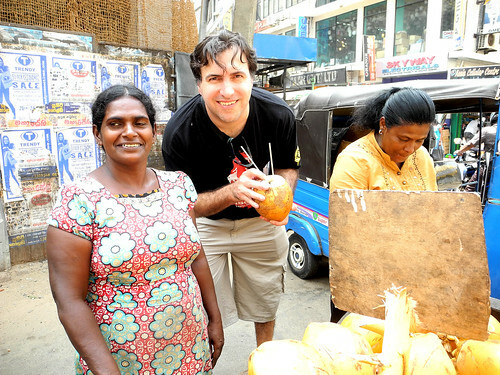 Sri Lanka is truly a place of multicultural diversity and now, since after the war, a place of increasing tolerance. 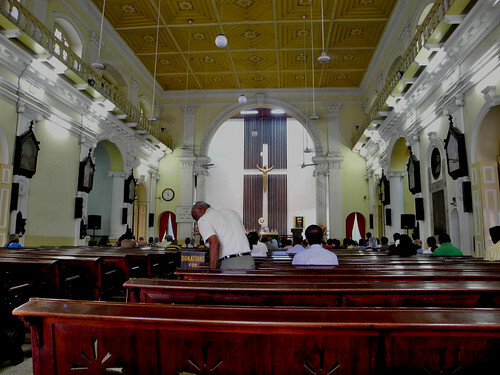 Everybody knows the tragic recent history of Sri Lanka and the destructive war in the North, but in Pettah Market there are Hindu Temples, Mosques and Catholic Churches dating back quite a few years that are close to each other and seem to get along with each other and coexist peacefully. As you can see in the video, the first place we stopped at was the Hindu Temple. It was a fairly interesting experience being inside, especially watching how the priests were serving the worshipers who were asking them to do stuff for them. 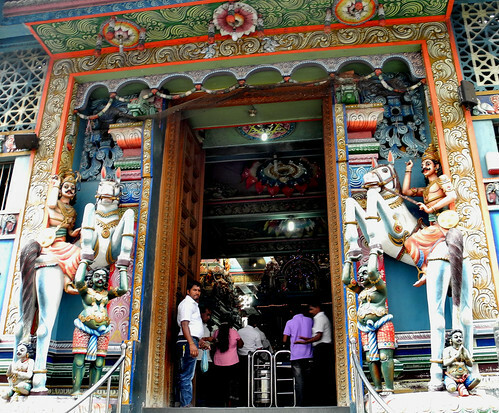 The picture below is the entrance to the Hindu Temple. It was a curious place to visit for the uninitiated. The second place we stopped at was the Mosque. We went inside but weren't allowed to take pictures and we didn't get any decent pictures outside. As I mentioned in the video, the Mosque was erected in 1908 and is now in the process of being renovated. The next place was the Catholic Church. We actually needed the rest. It was hot and dusty outside and the Catholic Church provided a cool sanctuary from the heat and a place to take a breath and see what would come next. While we were in the Church the Catholic Mass started and they started singing some of our favorite hymns so we stood up and joined in. Visiting the three places of Worship was interesting however, one thing they all had in common, and something that we would experience throughout our trip, was the constant request for donations and contributions. In the beginning I was fairly generous but by the second day I was not too happy and stopped being so generous as it was really eating into the budget. So it is something to be aware of if visiting. 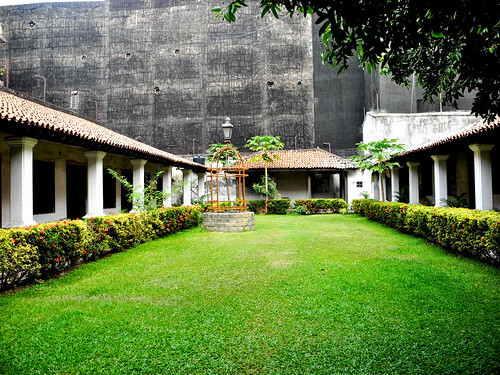 Our second sanctuary from the heat of Pettah was the Dutch Colonial Museum that was fairly easy to find. 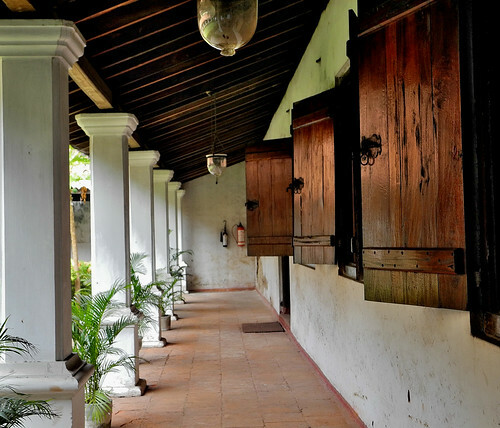 It has a lot of old stuff that details the Dutch presence in Sri Lanka and I am sure that if you are fond of colonial history you would find this little museum fascinating. As for me I personally enjoyed the relaxing garden in the middle of the museum. It was filled with cinnamon trees and papaya trees and really was a great place to escape from the crowd outside. I think it was expensive to go in, and you had to pay for the camera and video, so I personally don't think it is worth the cost, but still, if you must or feel like escaping, it is not a bad place at all. Once again I thought the museum was a great place to take a break from the streets but I did think the entrance fee was high. Still, the building itself is historical and old and it was interesting to see the rooms where the Dutch administered part of their colonies. 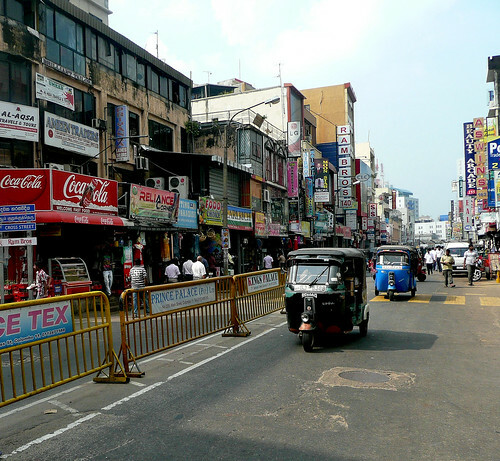 The streets of Pettah Market were hot and dusty on the day we visited. It was still fun though. There were lots of tuk-tuks in the street and the crowds of people added a tremendous vibrancy to the place. We thought the transportation methods used to get stuff from one place to another was fairly interesting too but it looked like tough work. As you saw in the video we ended our time in the market by eating some samosas and drinking water at a road side cafe. That was great too. I enjoyed just sitting them and enjoyed watching the crowd go by. Queenie struck up a conversation with the proprietors and it turns out that they came from different parts of Sri Lanka and were trying to make a living in the big city. They were super friendly and represented the friendliness we would encounter all around the island. 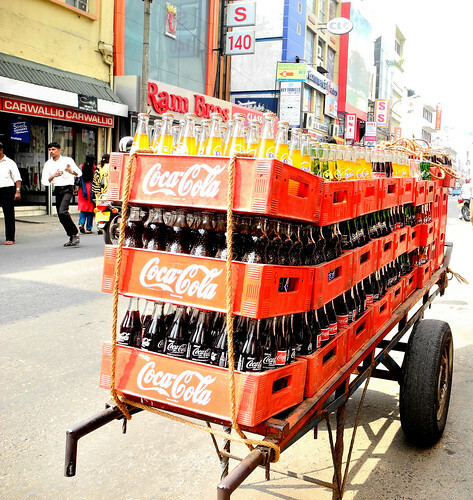 The last question to answer is would I recommend Pettah as a place to visit. I am used to traditional and local markets and love going to visit them (see Uzbek Tales pt. 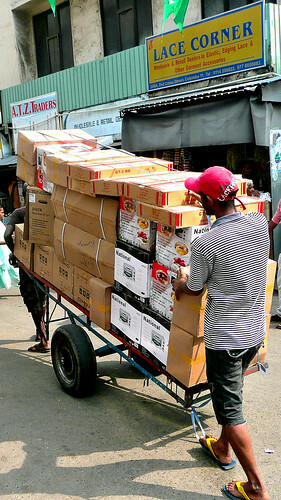 5: Urgut Bazaar) but since Pettah is a wholesale market I don't think I would go there again if I was in Colombo: we had an interesting time, saw some interesting things in the market, but I got the feeling that there were other places and things to do in Colombo and if time is short would probably recommend people go to some of the other places. Paul, would you care to elaborate on what you saw that was shocking? MJ if you look in the video at around the 2:45 point you will see a woman with a mangled cleavage walking down the street with her shirt open asking for money. It was quite shocking to see that. I have seen a lot of mangled bodies in Africa (where I grew up) and Asia and it never gets easy. It always shocks. Thanks for reading and the comment. Appreciate it. Paul, i did see that but i didn't know what i was looking at. it looked like a print on her shirt, and i figured that ladies there wouldn't walk around with their breast exposed; now i'll have to go back and take another look now that i know. thanks for the info Paul. I see - yes I can understand the confusion - when we initially saw her we didn't know either - and that was in person. It was a shocking to see as I said - we never found out what happened to her but a lot of people we saw had been mangled by the war in the North. It was good to see people starting to rebuild their lives now that the war is finished. Thanks always for reading my blog, watching the videos and commenting. Always appreciated.